Now for the science bit. Well, not really, but having reached this far, you probably want to know a bit about the stuff that's available for scratchbuilding. First, motors. There is actually a fairly reasonable selection of motors around but they take a bit of searching out. 1 is a Sagami 1017 mounted on a 2mm standard gauge chassis. 2 is a Sagami 1013, of a later type which has a stronger 1.5mm shaft. 3 is a Faulhaber 1212, a 6 volt coreless motor. This one has worked fine on 12v for ages and is about to go into a new chassis. This motor only comes with a small 1.5mm diameter stub shaft, so the first stage gearing has to be a spur reduction, not a worm. 5 is my favourite, the trusty Mashima/Tenshodo. Almost bulletproof, perhaps the Ford V8 of small scale motors. 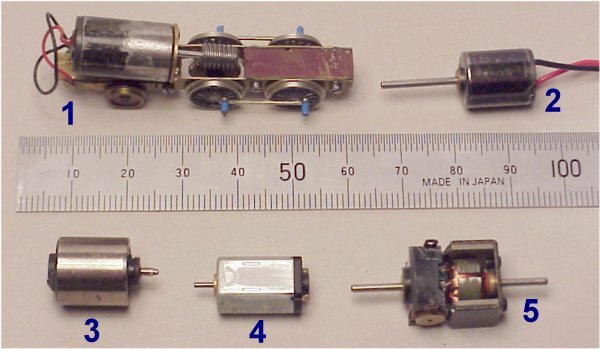 Almost the same range of motors as before, but A is a 6mm diameter pager motor. 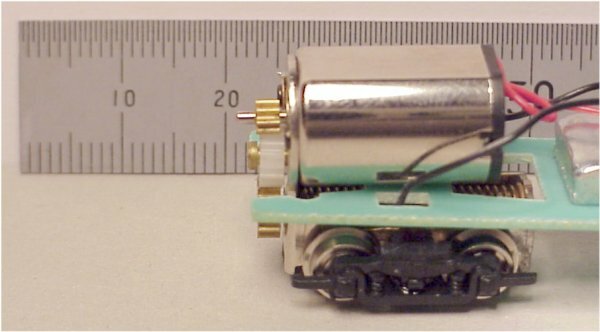 This is the little motor that makes message pagers vibrate. 6mm in diameter, 12mm long. Only 1.5 volts, so it's a little delicate, but geared correctly and supplied from a current limited controller, it'll survive OK in that small show-stopping novelty loco. B is the KP00, C the Faulhaber 1212, D the Sagami 1013 and E the Mashima 9/16. Gear information: GEARMESH.XLS - an Excel spreadsheet giving the sizes and meshing centres of the 2mm Scale Association gears (also available from Ultrascale). For those with other spreadsheets, use GEARMESH.CSV if you have problems loading the Excel file. Now on to wheels. Hopefully, this picture above will explain a little more about the concept of split frames. 3 shows the rear of the driver and the half-axle. The entire wheel is electrically live. 4 shows a pair of wheels pushed into the axle muff. The half axles are of the right length so that when set to the correct back to back dimension, the axles do not touch. Serendipity strikes. If you take some 2mm Scale Association disc wheels, push the half axles through so an equal amount protrudes either side of the wheel, the wheels can be mounted on a standard 2mm muff and have the right back to back for running on 6.5mm gauge track and the stub axle on the wheel face can be used in an outside frame, to make either a motor bogie, or by adding some cranks, a steam loco or rod coupled diesel. The Association makes disc wheels in 6mm, 7mm and 8mm diameters. In a photo below, you can see how this idea might develop. 2mm bits not small enough? OK, how about this stuff. It's made by Brian Clark of Saltford Models and is designed for 6mm gauge, but would easily work on 6.5mm gauge. The worm is bored out to fit on the shaft of the pager motor above. Remarkable! Now we turn up the boggle factor. This is a part built model of a German Schoema diesel which is now running on the Isle of Man as No.17 "Viking". Apart from the pager motor, it's totally scratchbuilt by Denys Brownlee. Unfortunately, he won't see it finished as he sadly died in December 1996. It's now in my possession and I intend to finish it in memory of a good friend. It's to 6mm gauge and won't run on 6.5mm track due to the fine wheel standards. The underside of the loco shows the gears to advantage. Note that the worm wheels are "throated" i.e. slightly concave. This is a much more efficient mechanically, but harder to make and mesh. The chassis illustrates the outside frame concept outlined above. If you can't find the right motor, you can always make one. Well, if you are Denys Brownlee, you can. This is his first attempt at a coreless motor for his IOM Beyer Peacock 2-4-0 "Loch". It worked but not well enough, so Denys built a second, more successful version. It's 6mm diameter and actually forms the boiler of the loco. If you are wondering what a coreless motor actually is, then this photo should help clarify matters. The copper armature A has no core, it's wound over a former and encapsulated in epoxy resin - hence the coreless bit. 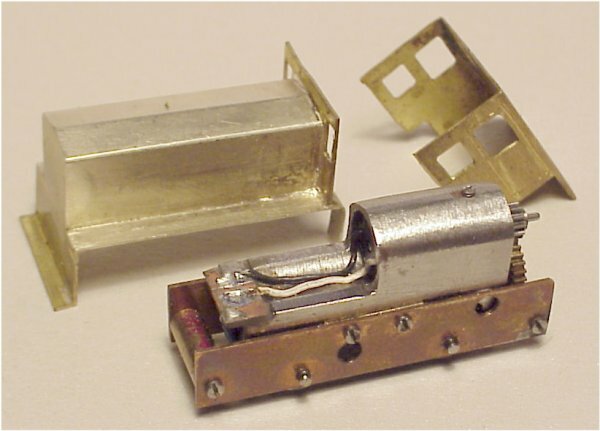 The magnet is cylindrical and is the silver and brass component B. A rotates around B. 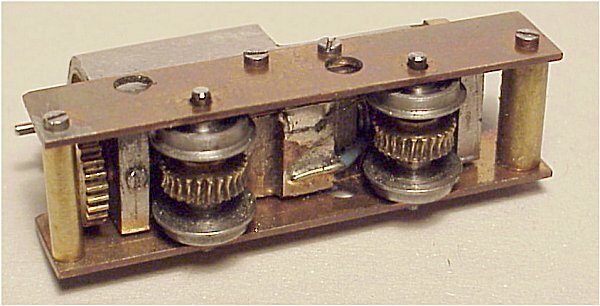 C is the brush carrier and D is the motor casing. There are some interesting things coming out of Japan these days. They have a massive N gauge market and the quality of product is very high and remarkably inexpensive. This a Green Max "N Gauge Kits Power Unit". It's a bogie chassis of which one end has a self contained motor bogie with a triple gear reduction. The wheelbase is 13mm and from initial inspection, it could be narrowed. The cost in the UK is about £22. I believe this unit is designed to fit a Japanese streetcar static kit.